Time to put my kids to work! A great way to get kids in the kitchen preparing food is Jell-O instant pie filling. 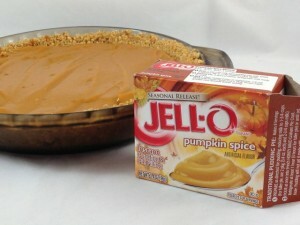 In the case of pumpkin spice, it’s an opportunity for my children to make their first pie, Jell-O pudding pumpkin pie. 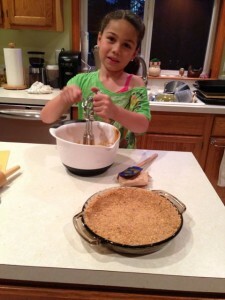 Before preparing the pie filling,we made a graham cracker crust, using a recipe from www.food.com. It took about 15 minutes to make this crust. Once the crust began to cool, my older daughter followed the directions on the package of Jello-O and made a traditional pudding pie. She used a crank hand mixer; so I needn’t worry about her getting hurt by an electric mixer. The pie looks delicious, reminiscent of a traditional custard pumpkin pie, but with about 1/8 of the time to prepare. Not only did the pie look like pumpkin pie; it tasted very close to pumpkin pie. There is cinnamon, ginger and pumpkin flavor. 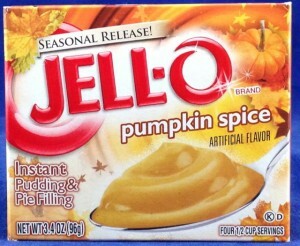 I am very impressed with the pumpkin spice flavor in Jell-O pudding mix. Sugar, modified cornstarch, natural & artificial flavor, cinnamon, ginger, salt, disodium phosphate & tetrasodium phosphate (for thickening), mono and diglycerides (prevent foaming), yellow 5, yellow 6, caramel color, artificial color, BHA (preservative). My daughters were excited to try the pie they helped prepare and they also thought it was delicious. They didn’t obsess over it like they do traditional pumpkin pie. Jell-O pumpkin spice pie pudding is fun, easy, tastes good, but has a lingering bitter note that is typical for instant pudding. 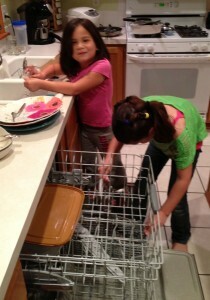 The best part about the pudding, was that it got my kids motivated to work in the kitchen; even with clean up. A special thanks to Food Technologists: Megan for the pie filling mix and Pat for encouraging me to get my kids in the kitchen.